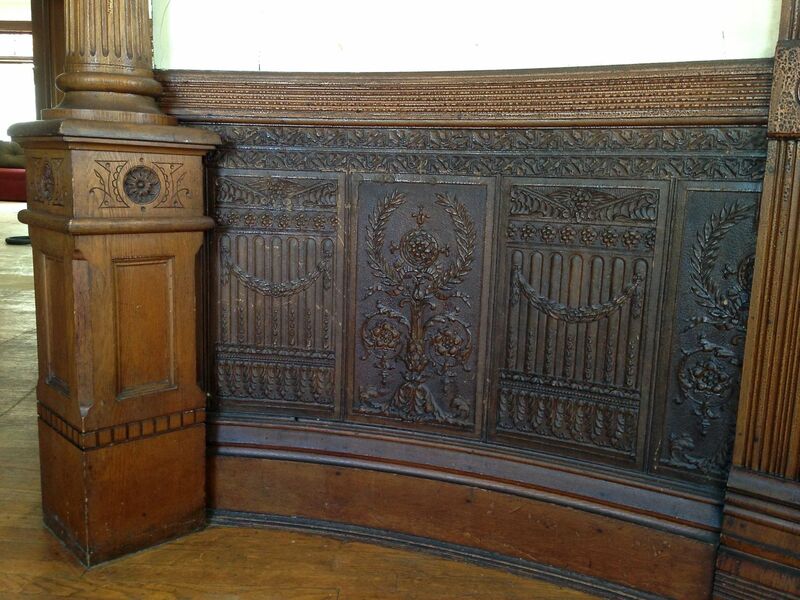 Recently I did a post about “discovering” the fabulous hardware of the Cross House. Although I had been aware of the hardware, and knew that it was incredible, I did not really understand just how incredible it was until recently. However, from Day One, I was highly aware that the first floor of the house was blessed with amazing Lincrusta. About a year ago I did a post about the Lincrusta. The entry hall, receiving room, stair hall, back hall, and dining room of the Cross House all have Lincrusta wainscoting. This image in from the round receiving room. [NOTE: It thrills me that I a) have a receiving room, and that b) it is round.] 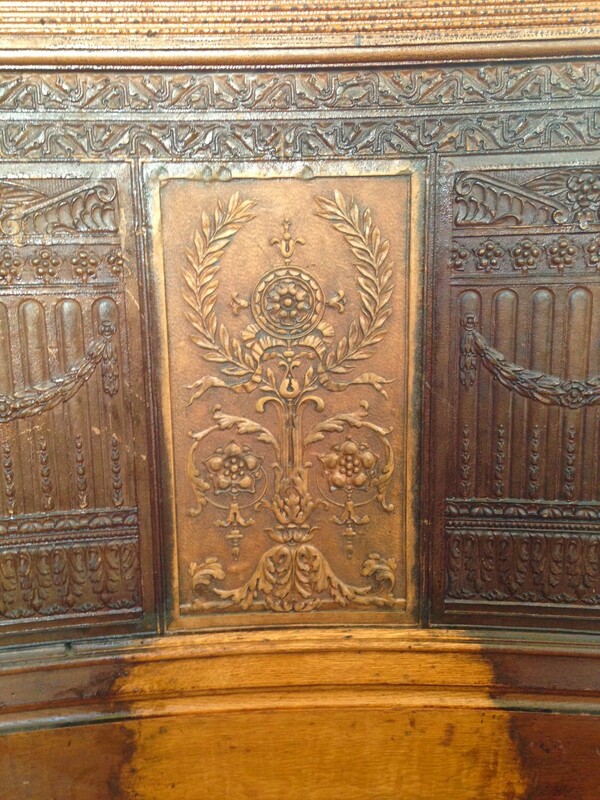 The Lincrusta (and wood trim) is dark from old shellac, and for two years I have often wondered: WHAT does it look like underneath all the old shellac? I cannot express enough my THRILL at this discovery! Under all the dark, depressing old shellac is this GLORIOUS beauty! ZOUNDS! 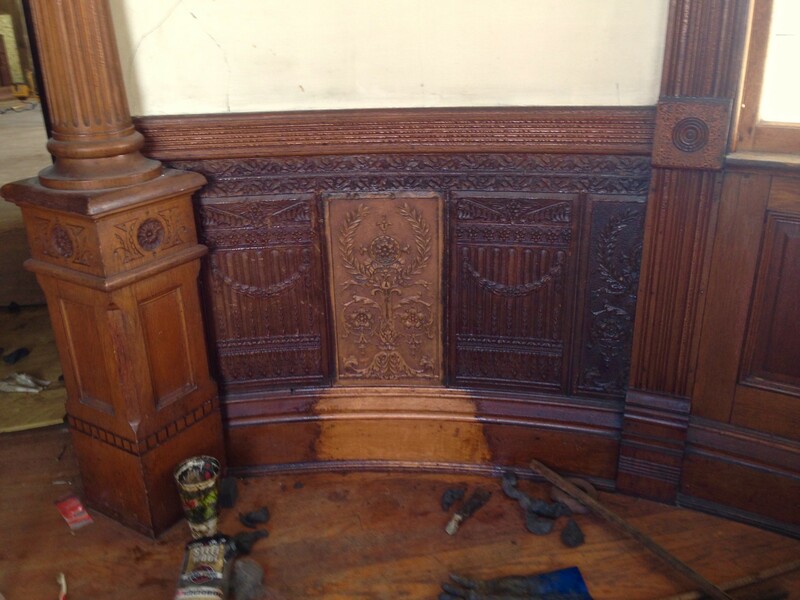 Just beneath the Lincrusta is the base moulding. Of course, my minds simultaneously reels at the thought of how many linear feet of Lincrusta needs to be refinished. But, to advance beauty? I will walk through fire, baby! Fire!!!!! I have been using denatured alcohol to remove the old shellac in the Cross House, liberally applied, and gently rubbed with 0000 steel wool, an old toothbrush, and a dull scraper for the intransigent bits. I have been WAITING for the Lincrusta updates and closeup photos! It is fabulous! I wish I were closer and could come over and help you out. Who cares about mere distance? Betsy, the Cross House needs your help!!!!!!!! You have six weeks soon to be available?????????? Betsy! Jump on a plane and come to Kansas! I will put you to work revealing the glory of the Cross House Lincrustra! Wow. Just wow. Jaw dropping! Stunning and every other adjective in the book. If you’re removing the shellac, and now have a ‘naked’ surface, are you refinishing it with anything? Could you imagine being the maid that had to keep all that detailed woodwork and such dust free? Without the modern wonders of Swiffer dusters! The surface revealed is not naked! That is the original 1894 finish. Just buried under decades of old shellac. What is the original finish? Would the original finish have been perfectly fine to be on it’s own for 100+ years? Did folks just polish with shellac on a daily/weekly basis? Or is it something that would have been applied in a whole layer for spring cleaning? I’ve never used the stuff. It’s so beautiful! And that room will just be a pool of light when it’s all finished. Unlike Betsy, I am back in Emporia all the time. I would love to learn how to remove shellac without removing the original finish. I’ll let you know the next time I’ll be back in town, and I’ll see if you could use a few hours of willing labor. Try a dowel sharpened in a pencil sharpener kept in a bottle of denatured alcohol for tight spots. You can also sharpen them to less of a point for wider spots.